What is 3 wheel roulette and where can you play it? Here's my quick guide to how this version of roulette works, along with a list of online casinos that offer it. Online casinos with 3 wheel roulette. Note: I've also included online casinos with "multi wheel" roulette tables. 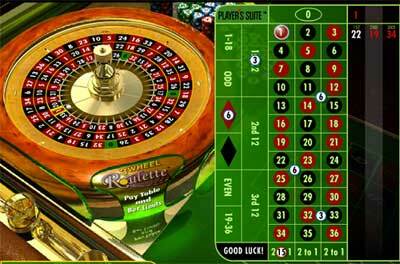 This version of roulette is different to "3 wheel roulette" (there are multiple wheels instead of multiple rings of numbers), but I thought I'd include these casinos here in case anyone is searching for those roulette games in particular. What is 3 wheel roulette? A screenshot of the 3 wheel roulette table in action at Sky Vegas. 3 wheel roulette is almost the same as normal European roulette, except that there are 3 "rings" of numbers on the roulette wheel instead of 1. There is still only one ring of slots in the centre of the roulette wheel that the ball can fall in to though. All of the outer rings line up perfectly when the wheel comes to a stop. Therefore, on every spin of the wheel there are 3 individual results that can pay out. The result of this spin is 22 black, 19 red and 34 red. If any of these results line up with where you placed your bet on the standard roulette betting area, you win money. The more of these results that hit your bets, the more you will win. Every bet you make when playing 3 wheel roulette online is tripled. So for example, let's say you place a £5 chip on "red". This bet will automatically be tripled to £15, making your total wager for that bet £15 instead of £5. A £5 bet on "red" is for the first wheel. A £5 bet on "red" is for the second wheel. A £5 bet on "red" is for the third wheel. Basically, it's just like making the exact same bet 3 times in a row and then totting up the results. It's a very unique and strangely fun way to play roulette. Note: It's not possible to bet on a single "ring" of the 3 wheel roulette wheel. Every bet you place on the table is multiplied by 3 no matter what, with each of those units being used for each ring on the wheel. Note 2: Furthermore, it's not possible to bet more on one ring than another in one bet. An equal betting unit amount is placed on each of the rings when you place your bet. Bets, odds, payouts and house edge. For each individual bet, the odds and payouts are exactly the same as they are in European roulette. Just remember that your total bet on each number is split up in to 3 for each individual ring of numbers. Interestingly, the probability and house edge of three wheel roulette is the same as European roulette too. As mentioned earlier, in 3-wheel roulette it's just like placing the same bet on 3 individual spins in normal roulette, except they all happen in one go. Therefore the house edge for each of the normal table bets does not change – it stays at 2.70%. This is a good thing, as these new roulette variants usually give worse odds than the original versions of casino roulette. Special bets (colour up bonus). The colour up bonus bet and payout table. It wouldn't be a fun variation on standard roulette without a new bet thrown in to the mix. Along with all the standard straight bets, red/black, column bets and all that, there is a "colour up bonus" bet on offer. Within this bet are a handful of payouts based on how the results of each of the 3 roulette wheels line up. Note: You can't bet on each of these possible outcomes individually. Instead you just bet on the "colour up bonus" which covers all of the above outcomes. Does 3 wheel roulette exist offline (in real casinos)? I doubt that it would be popular enough amongst casino go-ers. It would be an incredibly difficult game to construct and run. Casino gamblers love their blackjack, craps and standard roulette. Although these fancy new games are cool, they rarely get the attention you'd think they deserve. Secondly, actually constructing a fair 3-wheel roulette table would take some feat of engineering. On top of that, it would be far too confusing for the croupiers to run the game efficiently. Nonetheless, I'm happy enough playing 3 wheel roulette on the Internet. The in-game graphics are impressive, so I have no complaints in the realism and entertainment department. Overall it's a fun variant of roulette, regardless of whether it's played online or offline.